Light it up with lamps. Chic lamps provide both added lighting and appealing decor. Make that fireplace glow. Scrub away soot stains and replace the old screen. If you’re using staging furniture or buying slip covers, choose light colors for an airy, inviting feel. Whatever amount of furniture you have in your living room, remove a few pieces to make the room feel spacious. Use bright, coordinated accessories like accent pillows and throw blankets for a chic splash of color. Help buyers imagine their life in your home. Set the scene by displaying a board game or tea service on the coffee table, and arrange furniture in conversational groups. Clear everything from countertops except one or two decorative items, like a vase of flowers or bowl of fresh fruit. Pack up all the dishes except one attractive, matching set. Do the same with glassware, flatware, and cookware, and pare down all other cupboard and drawer items down to the minimum. 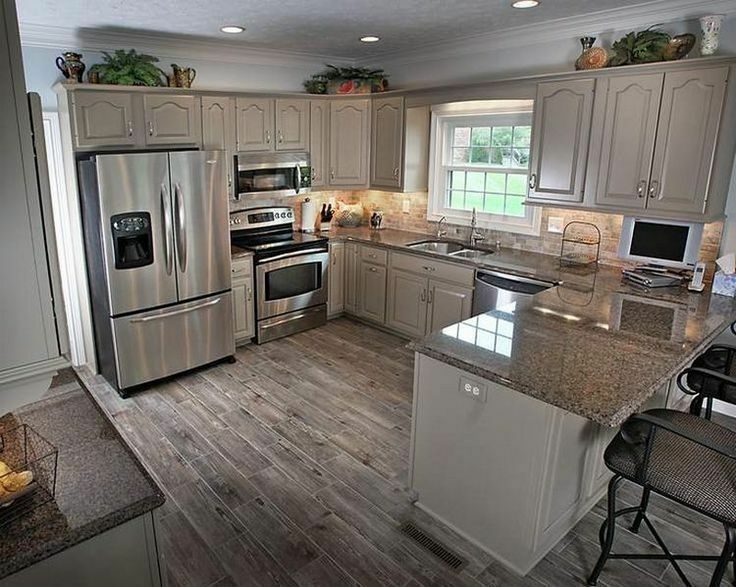 Freshen up and modernize those cabinets with a fresh coat of paint or stain and new hardware. Seriously evaluate your appliances. Can they look new again with a good scrubbing? Give it the old college try or consider replacing with new models. The Real Estate Staging Association strongly recommends stainless steel. Tip: You can get the look of stainless for the cost of a cheap dinner with stainless films. Remove those fridge magnets and give the door and handles a good cleaning. Scrub dirt, grime, and stains from walls, cabinets, and backsplashes. Clean cabinet interiors, especially under the sink. Clean and organize the pantry, leaving some empty space to make it look bigger. Store items in decorative baskets and display a few jars of fancy jam and other upscale condiments. Empty all trash cans and move them out of sight. Go gender neutral in the master bedroom. Ditch those dainty, floral pillow shams or NASCAR posters. Pack up all but the clothes you’re wearing this season to make you closets look larger. Swap out the motley crew of mismatched hangers in your closet for a set of wooden ones to create a classy, boutique look. Put jewelry and other valuables in a safe spot. Consider giving extra bedrooms a new identity as a home office, sewing room, or another interesting function. Remove televisions or video game consoles from bedrooms to depersonalize and create a serene setting. Avoid overstuffed rooms and oversized furniture. Too little space creates a claustrophobic feeling. Let buyers entertain the idea of entertaining. Set out some chic place settings around the table, or a few wine glasses and a decanter on the buffet. Strike a balance between overly formal and too casual with an attractive runner and a few fun, decorative elements — think small floral vases or short candle holders. It’s de-grime time: Scrub and sanitize the walls, floor, shower door — virtually every surface that comes in contact with steam. Spend extra time scrubbing that tile grout and re-caulk around the tub if necessary. If your bathroom tile is dated, try paint instead of replacing it. Start with a high-adhesion primer and either epoxy or latex paint. Remove clutter from the countertop, tub, and top of toilet. Clean surfaces until they gleam. Pack up and hide all your personal products — from medicine to razors. Create a luxury spa look with a fancy soap dispenser, fluffy white towels, decorative baskets, candles, plants, a white shower curtain, and a new bath mat. Fix leaky or running toilets and replace toilet seats. Take a daring sniff of the drains. Odorous? Clean them out, and deodorize with baking soda, boiling water, or vinegar. Time for a new sink anyway? Try a pedestal sink to optimize precious bathroom space. Have a dark corner or hallway? Brighten it up with a decorative mirror. Neutralize the walls. If any rooms are painted in dark colors, repaint white or beige. Paint adjacent rooms the same color to make the whole space feel larger. Fill nicks and holes in walls, and touch up with paint. Sorry, wood paneling. It’s time. Paint over paneling with a neutral color. To really cover your tracks, use wood filler between panels and paint over the entire thing. Wash the windows, inside and out. Repair any holes or tears in screens. Replace those family portraits with interesting art placed strategically throughout the house. Avoid leaving dead space on walls. Hang attractive house numbers that are legible from the road. Brighten up your porch with fresh paint or stain. Add a fresh coat of paint to the front door, preferably red, black, blue, or wood stain, so long as it complements the trim and doesn’t blend, says The Real Estate Staging Association. Steer clear of unconventional colors like purple. Buy a new doormat to welcome home buyers. Power-wash the house exterior, walkway, steps, driveway, and porch until everything sparkles. Make sure the locks and doorbell function. Make that mailbox look clean and welcoming, or get a new one. Plant lots of colorful blooms in attractive pots and planter beds. Trim back trees and shrubs from the approach to the front door. Store yard equipment and children’s toys out of sight. Get a hammock (or bocce ball game or raised fire pit) to show off how fun your yard can be. Dress up any imperfect planting area with mulch. Make sure entryway lights function and are free of cobwebs and insects. Hide trash cans, recycle bins, and garden hoses. Don’t forget your outdoor living space. Stage your patio like a second living room, with fashionable furniture, accent pillows, an outdoor rug, and other patio-friendly decor. Declutter! Consider it pre-packing for your move. Box up books, clothes, and personal items and place them (neatly!) in the garage or — better yet — a rented storage unit. Don’t forget to include memorabilia in those decluttering bins. Family photos, diplomas, and the kids’ artwork should all go. Keep closets, basements, and attics as empty as possible to maximize the appearance of storage space. Transform underused areas of the house — the alcove under the stairs or the end of a hallway — into functional spots. Add a desk to create a mini office, or a chair and small bookshelf for a reading nook. Swap dim lights for high-wattage bulbs. Check every door, drawer, and cabinet to ensure they open and close easily. Swap out any faulty — or dingy — hardware. Damaged or aging hardwood floors? Replace damaged boards with new wood, sand down the entire floor, and re-stain. Do a deep (deep, deep) clean. Hire a professional cleaning service to clean your home from top to bottom — including carpets — before viewings. Scrub those pet stains on the carpets and rugs until totally gone or replace them if necessary. Try cleaning formulas made especially for pet odors. Pet odors soak into your best friend’s favorite things. Completely remove pet beds (or Fido’s most-loved couch), blankets, toys, play structures, food bowls, and the like. Use air fresheners that eliminate odors, rather than simply mask them. There’s nothing worse than the smell of artificial pine with kitty litter undertones. Repair or remove any furniture that’s been scratched or gnawed on. Clean all pet “presents” from the yard. Keep cat boxes immaculate and hidden away, or — better yet — see how your feline-loving friends feel about a temporary houseguest and remove litter boxes altogether. If possible, remove any dog or cat doors. Pets? What pets? Keep your pets safe, when you leave the house for a viewing, take all the furry (or feathery or scaly) residents along with you. Make a pet hair sweep the last thing you do before you leave the house. Add a seasonal touch. Simmer cinnamon sticks in the fall and set out fresh cut lilacs in the spring. Tidy like you’ve never tidied before. Avoid cooking any food for your own meals, but do bake some cookies or other baked goods to leave a welcoming aroma behind. A good tip used by a favorite So Cal amusement park is to simmer a small pot of water and vanilla extract to create a welcoming aroma! Take off. After all that staging work, you deserve a trip to the spa while potential home buyers are busy falling in love with your house.